Fun layout! Love the colors and elements. I live in Central Ohio, USA. I am a mother of 4 awesome kids, 2 boys and 2 girls, ages 19, 17, 14, and 13. I am also engaged to the absolute love of my life, Roy and he has 3 amazing boys, ages 11, 9, and 8, his youngest was actually in my preschool class when he was 3. I graduated with an Associates degree in nutrition in May 2016. I am a Team Lead at a preschool until I find my dream job. I have been paper scrapbooking since 2000 and digital scrapbooking since 2006. I also used to design, but went on hiatus during a divorce and then again during my schooling. Hopefully I'm back for good! You may have seen me in other forums as rachelbrein, scarlettcharm or Rachel Martin. 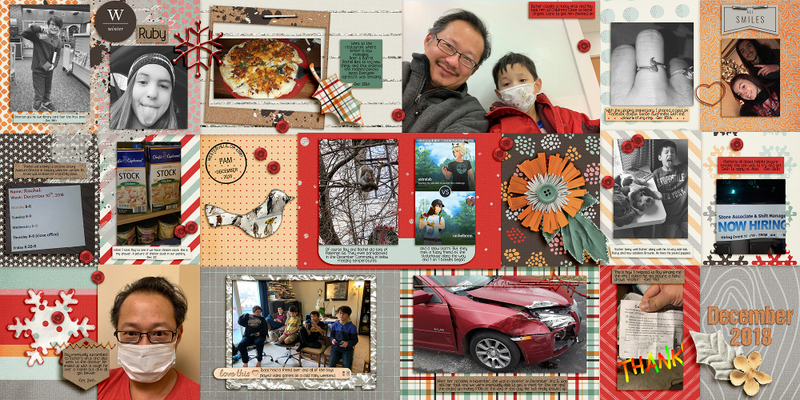 When I am not making memories, preserving them, sleeping or working, Roy and I are avid Pokemon Go enthusiasts, we also love binge watching TV shows and discussing filmography and camera angles and shots, the entire family is a lover of the Harry Potter Universe and all things Marvel, we love all types of music, and I love designing scrapbooking kits and elements. We also love attending live events around town including concerts, live bands, and plays (big and small). The kids often keep us busy with musical instrument lessons, High School Theatre, Softball, etc. We have a large busy family and we love it. I've finally decided to make an album and have it printed. I'll be documenting 2018, here is one of my first ever double sided pocket layouts. Thank you Marisa for your inspiration, templates, and fabulous kit!